1. Drag the Data Entity shape from the Document Stencil onto the model diagram. 2. 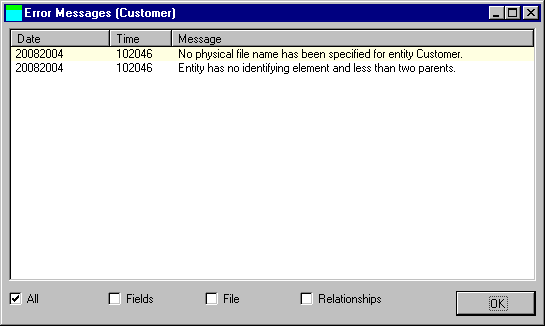 Enter an Entity name of Customer. Do not specify a physical file name for the entity at this stage. 4. Note the inverted red triangle to the top-right of the shape. Whenever you see this triangle, it means that the entity has error messages. Note that dynamic validation of the entity has taken place; you do not have to wait until you build your model in order to see errors that will prevent it from being built. From time to time in the remaining tutorials, when you see the red triangle, use the Error messages… option to see some of the different errors that are generated for an entity.